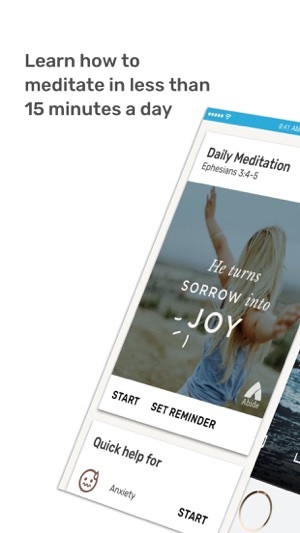 Abide is the #1 Christian meditation app that helps you sleep better and stress less. 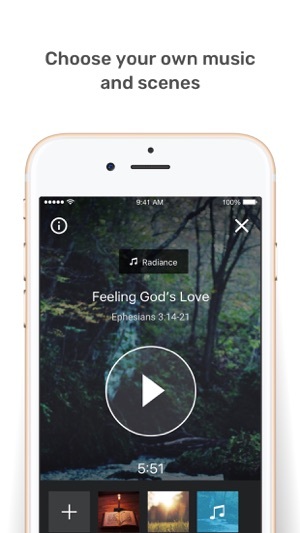 Find deep rest with our bedtime stories, as you listen to stories based off the Bible. 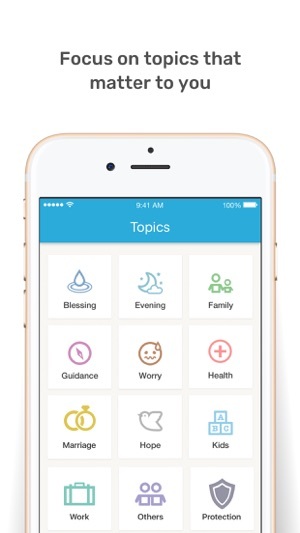 Wake up with our daily meditations that will fuel your mind for the day ahead. Join the millions of people meditating with Abide- including Grammy award winning singers, church leaders, and Christian therapists. After free trial, the subscription will automatically renew unless auto-renew is turned off at least 24 hours before end of the current period. You can go to your App Store account settings to manage your subscription or turn off auto-renew. Your App Store account will be charged when the purchase is confirmed. Unused portion of free trial is forfeited after purchase. 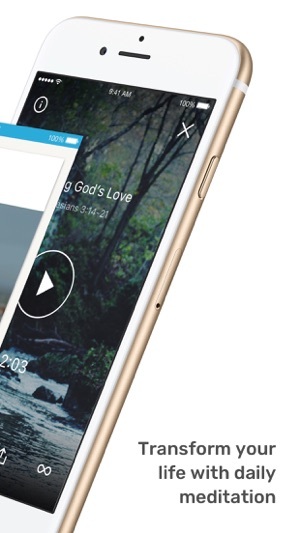 We've made it easier to start using Abide right after installing it on your device. Be on the lookout for our meditations through Passion week. I too was disappointed when I realized it was only a trial. I would like to humbly offer a suggestion to the developers. Try putting it out there for free and accepting donations via PayPal or Venmo. I truly believe if you trust the Lord he will supply your needs while allowing you to help hurting people find Jesus. I can say this with confidence because we have been in full-time ministry for 28 years reaching kids in public schools for Jesus. We provide teaching materials to our volunteers and backpack Bibles to every child we reach, which is in the thousands after all these years. We were able to do all this plus raise six kids of our own, all on donations from people who believed in what we do. We never ask for money or charge for anything we do, God just always supplied our every need. It wasn’t always easy but we trusted Him and He has been faithful to us. I just want to encourage you with this testimony. I know you offer scholarships from your ministry, but many hurting people find it hard to ask for financial help. It would be wonderful if all of it was free and God supplied the means for you to continue your great work. God bless you and thank you for your wonderful ministry. I know you are helping many find Jesus. It is a ministry that I know the Holy Spirit would lead me to donate to. I learned of this app through YouVersion daily reading plans. I absolutely love the daily lessons and interactive style allowing the listener to spend time communing with God during the reading. First - this app I found to be quite well rounded with many alternate choices for selecting type and length of meditations. Oddly enough I was very pleased with the narrator’s voices. They were soothing but not “syrup-y” or overly emotional. Just thoughtful. Without going on and on-suffice it to say I was blessed and uplifted by the first meditations-enough so to feel I would like this to become part of my daily quiet time with the Lord. I’m a little disappointed at the high price but as a former developer I understand the time and cost invested in development of software. And if some of that purchase price is defrayed to additionally support other ministries-well one can’t possibly object. Offering discounts to low-income, seniors, and disabled is a superb thought though I’m not sure how one verifies. I myself fall into this category and $30 means other things go un-met. But spiritual growth is a necessity! Incidentally the response to the reviewer who was so unhappy with the price and short trial period - well I thought the response was quite gracious. Thank you. Thank you for taking the time to review Abide and sharing your insight! 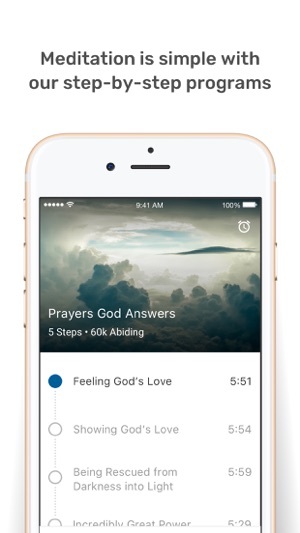 We are a very small, yet mighty app and sharing God's word through meditation/prayer is the priority of the entire Abide team...with God leading the way. Your kind words mean the world to us and please know that we always offer scholarships, working with all income levels, simply contact Kelly at support@abide.is! God bless you and thank you for Abiding in Christ with us! First I would like to explain why I rated the app a 1..when I initially downloaded the app I was over the top ecstatic! It was everything I was looking for, I liked it sooo much that I told a lot of family and friends about it because I felt they could benefit from such an amazing app AND THEN everything went downhill.. I was no longer able to choose my meditation options (other than the standard 2min) I also couldn’t use any of the other features as well without PAYING! Soo for this reason i give it a 1 because I no longer have a use for the app bc I’m not going to pay.. the app should just charge ppl from the beginning because the little I can do without paying is not benefiting me at all...I will be removing this app as soon as I’m done with the review. Hi seekGod1st. Thanks for taking the time to write this review. We appreciate your feedback. Abide is a listener supported ministry, and membership fees help pay for our ministry. We do provide free scholarships for those in financial need. Contact support@abide.is if this option interests you. Thanks!